Manley Bronze Valve Guides and Bronze Valve guide sleeves. 502" O.D. 1.625" length under flange. Threaded seal area above flange. Repair worn guides quickly and easily. Manley 12081-8 8 pcs. Bronze Insert Guide - .311" I.D. Manley Bronze Valve Guides .502" O.D., 1.625" Length under flange. Threaded seal area above flange. Manley 12084-8 8 pcs. 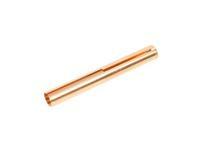 Bronze Insert Guide - .274" I.D. Part# 42157-32 32 pcs. Fits 5/16" valves. O.D. is 11/32"
Part# 42158-32 32 pcs. Fits 11/32" valves. O.D. is 3/8"
Part# 42159-32 32 pcs. Fits 3/8" valves. O.D. is .407"
Part# 42161-16 16 pcs. .034" wall to convert 11/32" guides to accept 5/16" valves.